NATIONAL ASSOCIATION OF WOMEN OWNED SMALL BUS | PINK Is Not Just A Color~It's A Movement! PINK Is Not Just A Color~It's A Movement! 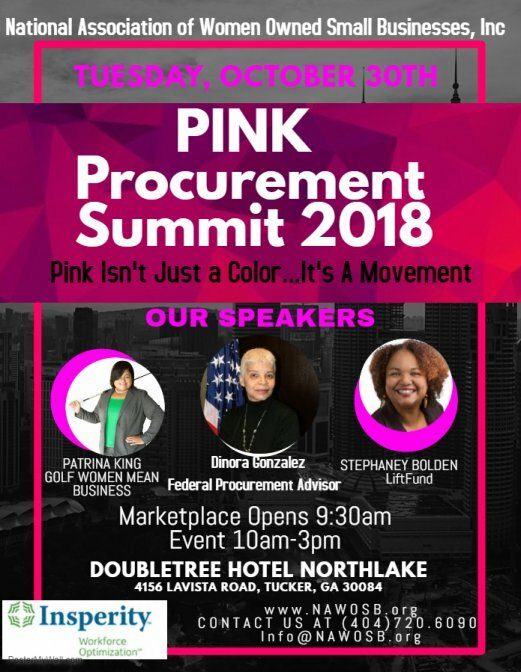 You're invited to our Annual PINK Procurement Summit 2018. If you want to grow your business, need funding, interested in procurement (contracts), want to network with successful business professionals, be better positioned for 2019....this Conference is for YOU! SPONSORSHIP & VENDOR OPPORTUNITIES AVAILABLE! !